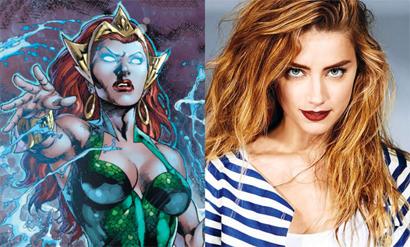 Obviously the big news for Aqua-Fans last week was that actress Amber Heard (The Danish Girl, Machete Kills) has been confirmed to be playing Mera in not only the Aquaman solo film in 2018, but in the Justice League film slated for release next year! I just haven't seen much of Ms. Heard's films to have much of an opinion on whether this is a good choice or not. But one thing I am happy about is that Mera is going to be in the Justice League movie at all. That suggests the Sea King will have a significant role, so much so they have made room for his better half. It's a like a dream come true, Aqua-Fans!